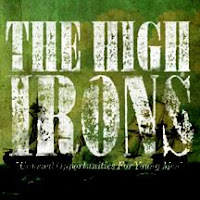 Album Review: The High Irons "Unusual Opportunities For Young Men"
The members of the alt-country band The High Irons are back with "Unusual Opportunities For Young Men." After a few well-received albums, the Brooklyn, New York band has retooled and created a cool, retro-cowboy vibe that could ignite their career with Americana and alt-country audiences. The album begins with the western "Lovesick Hearts" that features an intense vocal performance. But the recording really picks up steam with the rockin' "Carolina." This cut could be a hit on Texas country radio with its rollicking melody and memorable lyrics. "Country Hardball" has much of the same charm. The title track offers piercing lyrics and mixes an 80s rock sound with Americana sensibilities. "Long For Your Touch" offers elements of British Invasion. However, another potential country chart hit is the Red Dirt-tinged "Message" with its easily hummable melody.